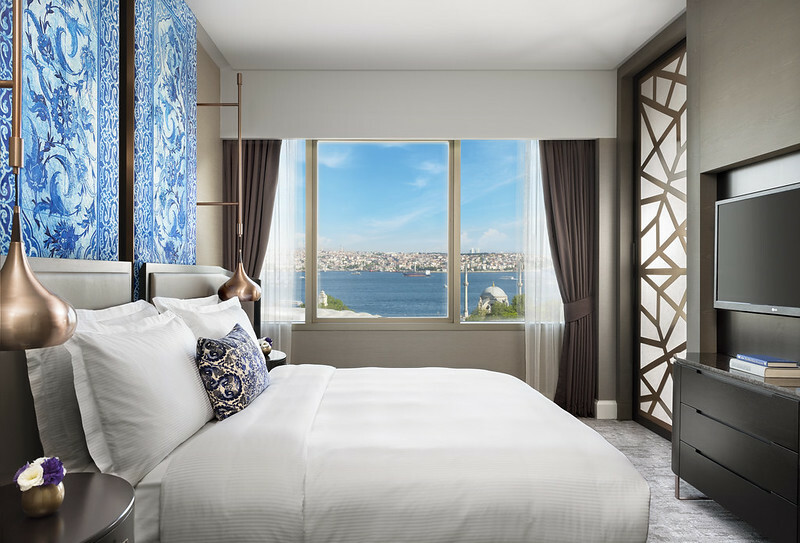 The Ritz-Carlton Istanbul has completed a comprehensive renovation programme including the upgrading of its rooms, public areas and conference facilities. The hotel opened in 2001 and occupies the first 14 storeys of a 32-storey building in the Besiktas district of Istanbul. Other floors include private residences as well as offices and several consulates (security is therefore very strong for hotel guests as well, a factor when Istanbul and Turkey is recovering from security issues). Its location on a hill (though five minutes from the Kabataş tram station) means that although reception is on the lower ground floor, there are immediate views across the surrounding grounds, and some 80 per cent of rooms have Bosphorus views. The hotel is located next to the Vodafone Arena (where Besiktas football club plays). The new design for the hotel is Turkish inspired, with Iznik tiles adding a stream of blue to reflect the Bosphorus views, and with technology upgraded so rooms have wireless charging on desks and upgraded bathrooms, though retaining the original marble. The hotel has 243 rooms including 21 Executive Suites and 57 Club Rooms, with sizes ranging from 38sqm park view rooms to 64sqm suites. One floor is a smoking floor. Also upgraded are the 12th floor Ritz-Carlton lounge and the conference rooms – the largest of which can hold up to 650 for a banquet. The extensive spa and leisure facilities, including the city’ largest indoor hotel swimming pool, and both an outdoor and indoor spa have not been renovated. Speaking with Business Traveller during a visit to Hong Kong, general Manager Nicolas Kipper said the hotel was well positioned to benefit from the recovery of tourism to Turkey and Istanbul, particularly when the new cruise terminal opens towards the end of 2019. Istanbul has now seen the opening of the new airport at Arnavutköy, though doubts remain over the date of the transfer over from the existing Ataturk Airport and the new facility, and this may be subject to further delays because of the formidable logistical challenge of transferring so much equipment to the new location from the existing one (a distance of some 20 miles).